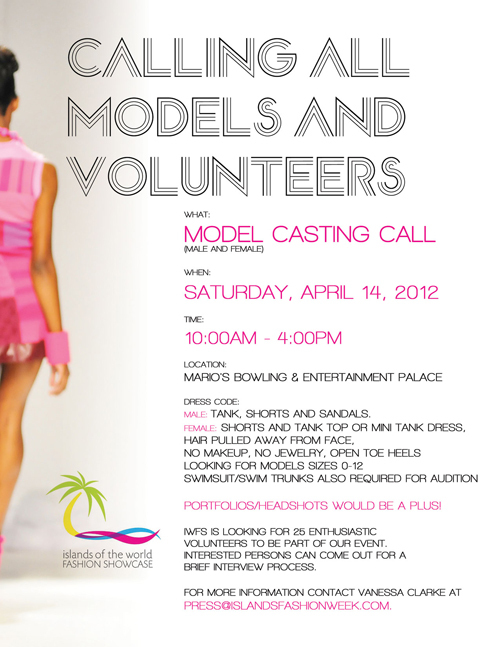 For more information contact 242-601-3633 or 242-424-2345. Endorsed from its inception in 2008 by the United Nations Educational, Scientific and Cultural Organization (UNESCO), Islands of the World Fashion Showcase (formerly Islands of the World Fashion Week) has been successful in fulfilling its mandate of promoting island designers from around the world and exposing them to international media and buyers. It is also mandated to expose its audience to four underlying themes affecting small-island states today - cultural diversity, the environment and climate change, poverty alleviation and the education of youth on HIV/AIDS. The two-day event will highlight international designers each season. The event in May highlights designer resort, sports and swim wear and accessories while November will feature designer couture, pret-a-porter and casual wear and accessories. Designers will vie for several awards including the NextGen Designer, Sustainable Eco-Fashion, Culture & Fashion and the Seals of Excellence.